When people talk about different kinds of saving, there are a lot of terms that get thrown around. “Sinking fund” is a term that’s frequently used, but often gets misunderstood. I love sinking funds and they can be a great way to avoid debt, so I thought I’d clear up some of the confusion. A sinking fund is a way to prepare for a planned expense by saving a fixed amount over time. For example, imagine you want to buy a new couch in two years. You know it will cost about $2,400. You can set up a bank account, envelope, line item on your paper budget, or category in an online budgeting tool for a “couch fund”. You’d take $2,400 divided by 24 months to figure out that you need to save about $100/month to reach your goal in time. Based on your own cash flow, you may decide to save exactly $100 every month. It might make more sense to save different amounts every month (if you have variable income). The idea is to save up a set amount of money in a set amount of time so that you can purchase the item with cash. How Is That Different from a Rainy Day Fund? A “rainy day fund” is generally set up for something that you know is coming, but you don’t know exactly when or what it will cost. A great example of this is a car repair fund. If you own a car, it is a guarantee that you will need car repairs. The difference from the couch example is that you don’t know exactly when you’ll need car repairs (other than basic maintenance) and don’t know exactly what they’ll cost. All you know is that they’re coming sometime and they will probably be pretty expensive. The amount saved in a rainy day fund is an educated guess, not an exact amount. Emergency funds are like rainy day funds, but for the completely unexpected things that life throws at us. Ideally, your emergency fund should only be used for things that you truly could never have anticipated happening like major medical bills, job layoffs, or a family death. We all know things like that are possible, but we don’t really anticipate them happening on a regular basis. Things like car repairs, minor medical bills, and home repairs are part of everyday life and should be anticipated with rainy day funds instead. The goal of all of these funds is to expect the unexpected so you can remove the money stress from your life. 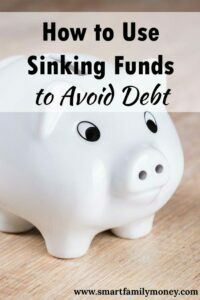 How Does a Sinking Fund Help Avoid Debt? Not using credit for the purchase. If you’re saving up for the purchase of the couch, you’re not going to use credit to pay for the couch. Acting as a bonus rainy day fund. While you’re saving up for the couch, if disaster strikes, you can always divert your sinking fund to other uses. If you have $1,000 saved towards a new couch and you’re hit with major medical bills, you can delay your couch purchase a little longer and take care of those medical bills with the couch money. 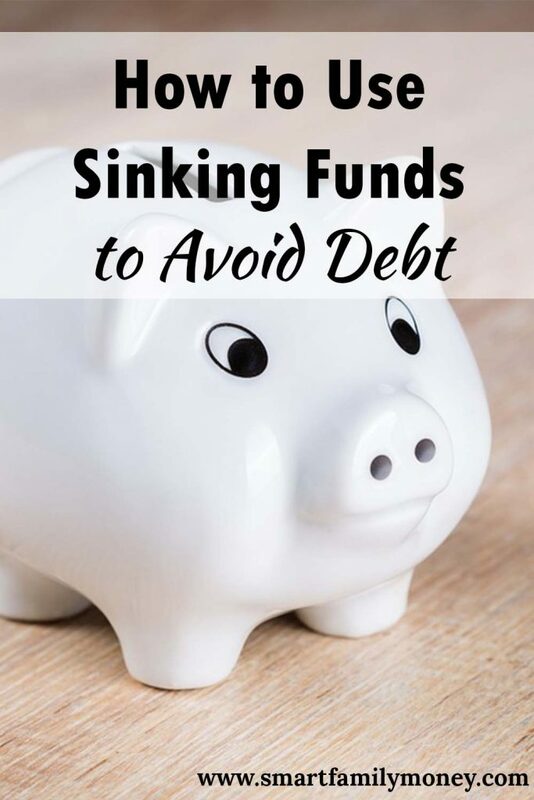 What Can a Sinking Fund be Used for? Notice that most of these items are recurring. Once I finish saving up for it, I’ll start saving for the next time. For example, my Christmas fund gets started over again every January. If you recently had an expense that fits into these categories and you needed to use credit to pay for it, think about starting to save immediately for the next time. For example, if you just bought a new cell phone using credit, figure out how long it will be until you’re going to upgrade and the average cost of a new phone. Divide the cost by the months and put that amount away every month in your “next cell phone fund” so you’ll be ready to pay cash for your next phone. In the end, it makes no difference if you call your budget categories sinking funds, rainy day funds, or emergency funds. All that matters is you’re preparing for all the expected (and unexpected) things that are coming your way. This preparation reduces stress and allows you to focus on the things in life that really matter. Do you have any sinking funds? Have they helped you avoid debt? Comment below. I love the recap on a sinking fund. My wife and I use a sinking fund (or as we like to call it a fun fund) for vacations and other fun expenses we anticipate down the road. It’s been incredibly useful in helping us reach our goals. Vacation sinking funds are the BEST kind, aren’t they? Thanks for stopping by!